Montblanc presents the Limited Writers Edition 2011, an intricately crafted piece celebrating the Italian author Carlo Collodi, the creator of Pinocchio, one of the most enduring characters in children*s literature. Collodi*s imaginary story of the wooden puppet in search of boyhood has enchanted generations and has been the subject of numerous adaptations in film, art and theatre. Carlo Collodi, born in Florence in 1826, worked as a librarian, translator, novelist, author, and political writer. Every detail of the limited edition is carefully designed to reflect Collodi*s epic masterpiece. The primary material is a dark-brown precious resin. The book*s colorful characters, including the voracious whale, the loyal cricket, the shady fox, the deceitful cat and the good fairy, are featured on the skeletonized cap overlay. A screw set into the clip symbolizes the joints of the famous marionette, while the cone is reminiscent of Pinocchio*s legendary growing nose. The limitation number and Collodi signature adorn the top of the cap, while the cricket on the 18kt champagne-gold nib completes this edition. 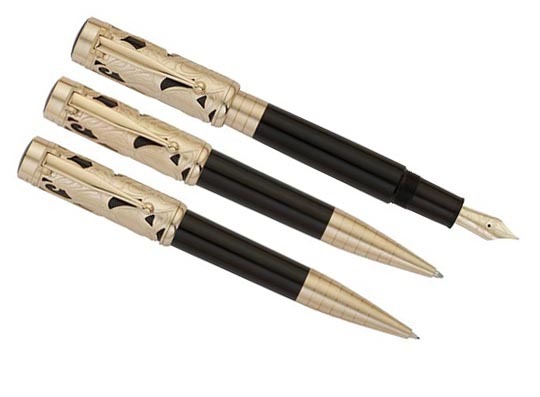 Limited to: 12,000 piston-fill fountain pens; 14,600 ballpoint pens; 8,400 rollerballs; and 2,000 sets consisting of fountain pen, ballpoint pen and mechanical pencil.